Community Eye Health Journal » Low vision care: who can help? Comm Eye Health Vol. 25 No. 77 2012 pp 14 - 15. Published online 18 June 2012. We know that, in many low- and middle-income countries, low vision services are limited to tertiary or teaching hospitals, which means that most people are not able to access them. If this is the case, who can those with low vision turn to for help? People with low vision do not fit comfortably within the job descriptions of most health and education professionals. Special education teachers are usually trained just to work with children who are blind, and may not have the additional training needed to help children use low vision devices and advise them about where to sit and the importance of using their vision. In fact, the services of all of these people are vital to ensure that the person with low vision can live a full life. One of the most important things we can do, whatever our own role, is to be aware of what other services may help the person with low vision and refer them. And we must communicate with the person, the family, and our colleagues in these other services about the care the person needs, in clear and simple language. People with low vision may need clinical care, refraction, and rehabilitation support, and children and others in full-time education will also require educational support. We may be the first point of contact for the person with low vision, or their last hope for help. Whatever the case, it is our responsibility to find out whether the people who come to us have received clinical and refractive error care. If they have not, it is essential that we refer them. If they have, we must find out what other support they might need and refer them. But it is not enough to just refer – it is also our responsibility to make contact with our colleagues in local community rehabilitation and educational support services. Refer people as appropriate, and share information with these colleagues about any changes in the needs and vision-related abilities of the person with low vision. 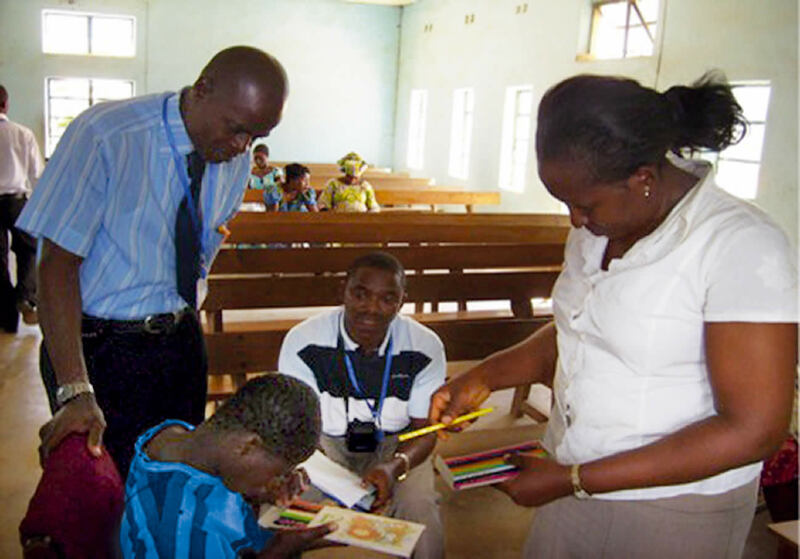 After diagnosis, refraction, and referral for low vision care, advise on non-optical interventions and environmental modifications (pages 7,8, and 12) and refer for educational support and community-based rehabilitation if needed. Secondary or district level At secondary or district level, services are aimed mainly at adults and older children who want to access print or perform tasks that require good near vision. The panel below lists the minimum equipment you will need to start a low vision service at secondary or district level. At this level, optometrists and mid-level eye care workers can be trained to give basic low vision services appropriate to their skills and experience. Ensure regular follow-up of adults and children who were seen at tertiary level. Training the use of low vision devices. There will be many more people with low vision in the community who need our services. Think about how you can reach out to tell them about what you offer. Plan outreach clinics, or link with others working in the community. Visit schools for the blind – perhaps there are children who will be able to use their remaining vision if they receive low vision support. Low vision work may be challenging, but it is immensely rewarding! Providing a basic low vision service at district level: what is the minimum we need? We have put together a list of the minimum equipment and devices you would need to offer a basic low vision service at district level. This list is based on our experience in the field, and we hope it will help you to start providing low vision support where no other service is available. Keep accurate records of who you see and how they have been helped. Collect quotes from patients saying how they have benefited, and use these and your records to ask for further training, increased funding, and better equipment for your low vision clinic. Always refer people with complex needs for services at a higher level. Pen torch and measuring tape. Reading acuity test. This can be created on computer using N or M sizes. Spectacle magnifiers: locally made high positive add spectacles, from +4D to +12D, in steps of 2D. Reading slit, signature guide, and writing guide: all locally produced. 2. Hasan Minto. Establishing low vision services at secondary level. Comm Eye Health J 2004;17(49): 5.